So the little monster living in our heads goes into overdrive, with a seemingly endless list of reasons why we should wait. How scary it’ll be. How we couldn’t possibly do it. That we aren’t clever enough to do it / don’t have the necessary skills / don’t have the money / fill in the blank. Or reminding us of when we did something different before and failed. And, before we know it, we’re stuck in the same old rut. Now here’s the rub. The little monster’s knowledge only comes from the past. What we’ve done before, heard before, learned before. He has NO imagination or creative powers whatsoever. If he’s faced with ANYTHING new he can ONLY come up with a solution based on our past experience. But, if you want to do something new – or in a different way – he can’t help you at all. In fact all he can do is help you to apply the same solutions over and over again. In other words repeat the same mistakes. And this is his most cunning trick of all, as you’ll seem to be busy – and working hard – but going nowhere at all. Guaranteed. Rather than helping you look at something new clearly and logically, the little monster frightens you into inaction with one illusion after another. But how can it possibly be anything but an illusion, as you haven’t been there before? So there’s no way he can know what’s likely to happen. When you take a step back to look at what’s been happening, it’s easy to see. Yet we fall for this cunning trick over and over again. One that’s designed to keep us “safe” but stuck. And by “safe” we mean doing the same things over and over again, so that you know what the outcome is going to be… While a little certainty is a good thing, this really isn’t the sort of certainty you want! The cure to waiting is quite simple, JUST START (!). This doesn’t mean throwing caution to the wind and diving straight in, but in taking a more logical look at whatever it is that you’d like to do. Doing your research. Finding out as much as possible about it, so you have a clear picture of exactly what it involves. What the potential risks and benefits are. By doing this you’re giving yourself the certainty that your little monster has been trying to give you, but in a positive and useful way. After all, only two things in life are certain (! ), but you can stack the odds in your favour by doing a little research. In the process you’ll feel much more confident and motivated. Enjoying the process, rather than worrying about things that may never be. If you get stuck, that’s when you enlist the help of your creative subconscious mind. The part of you that can come up with completely unexpected and new solutions. Those “ah ha” moments we all have from time to time. Glorious moments of serendipity when we bump into exactly the right person to help us or see an article online that provides inspiration. And how do you tap into this marvellous creative source? Well, that’s the easiest bit of all. Just go and do something else and let your subconscious take over. Then, when you least expect it, inspiration will come and off you go again. Instead of waiting for something that may never happen, you’re briefly waiting for inspiration, before continuing on your journey. Not only is this process easy but the natural way of doing things. By the time you’ve reached the point of making a decision about whether to go ahead – or not – it’ll be obvious which way to go. The best bit is that, whatever you decide to do, you’ve moved forward. You’ll have learnt all sorts of things in the process and so benefitted in ways you could never have anticipated at the start. Now compare this with what happens when you wait. Absolutely nothing. Or, put another way, you’ll have created certainty for yourself but the type of certainty you really don’t want. Guaranteed failure. 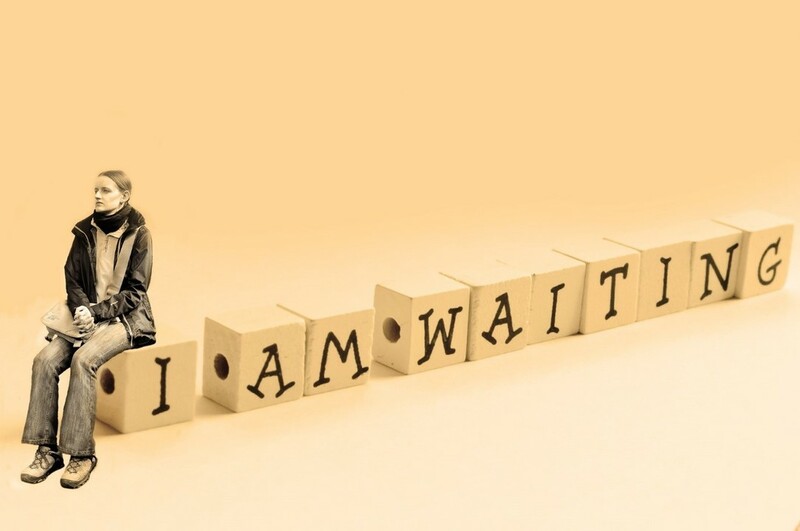 And we bet you’d never thought about waiting in that way before! Life is too short – and precious – to be spent on waiting. However things go, the only way you can ever move forward is to do something different or new. Going outside your comfort zone. It’s the only way to learn how to do things. And, if you think about the things that have happened in your life, how often has doing something new had results well beyond those you could ever have imagined?